The LightSheer is a new form of laser hair removal which, using the latest generation diode laser, has shown to be a successful method for permanent hair reduction. Unlike other systems, the LightSheer incorporates the ChillTip™ technology, which cools the skin as the laser works, decreasing skin damage and maximizing the treatment's effectiveness while minimizing discomfort. Each zap of the laser can treat 100-200 hairs, but can still be precisely focused, allowing hair removal from large areas or more delicate, specific ones. Before the start of each session, the laser settings are customized to your skin color, type, and the area to be treated. Any hair above the skin surface will be trimmed away, and tests on different areas will be carried out to determine how your skin responds to different device settings. A gel may be spread over the treatment area to keep the skin cool, and focus the light when the handpiece is moved over the treatment area. Light energy is emitted in flashes or pulses, heating the hair and damaging the follicle so that the hair cannot regrow. Most patients find that there is little discomfort during the treatment, though you may notice a tingling or pinching sensation. Local anesthesia can be used when very sensitive areas are treated. You may notice some redness and swelling which will normally fade within hours; this is actually a desirable indication that the follicle has responded to treatment. You should be able to return to normal activity immediately. How long does LightSheer treatment take? Depending on the size of the area to be treated, sessions can be anywhere between a few minutes to more than an hour. Several treatments may be required to ensure that all hairs are affected, due to differing growth phases. The number will vary according to your specific skin type, and the color, thickness, and density of your hair. 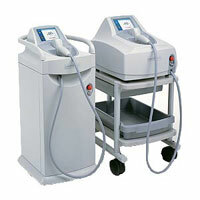 The LightSheer Laser System is FDA approved, and the procedure has unsurpassed safety records. On rare occasions, you may experience some blistering but this typically resolves quickly. Following treatment, the skin may change shade but will generally return to normal in a few weeks. You can reduce the risk of complications by limiting your sun exposure before and after each treatment. Individual results may vary, consult your doctor to make sure you are a good candidate.